If you want to relax yourself, so you have to try the fellucca ride in the peaceful River. It is amazing relaxing tour. 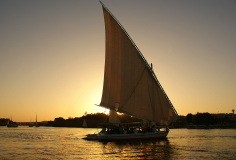 The felucca will take you to explore the banana island. They will offer you some bananas to try their taste.